Fear has been my companion in Jerusalem. 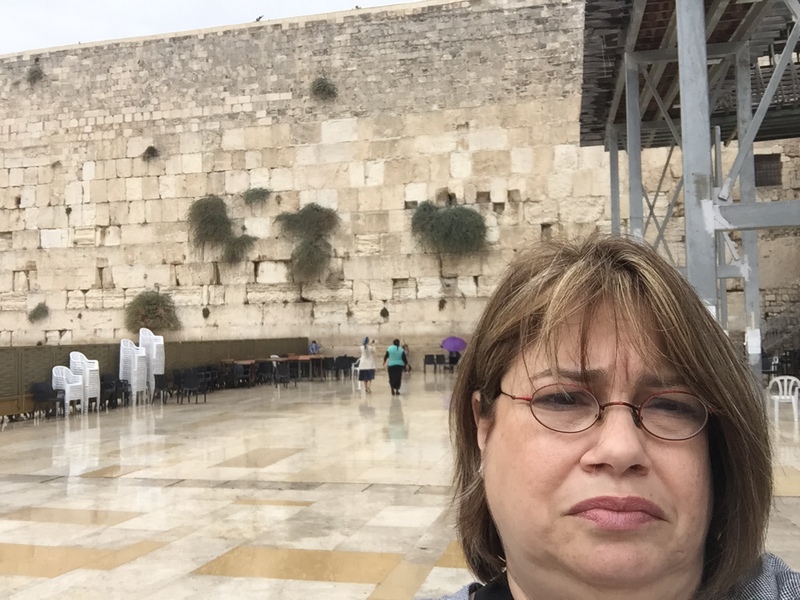 Last Sunday I went to the Kotel—the Western Wall–by myself. I was among the few people who braved the rain and the wind to pray and to wish and to marvel. But I was well aware of the boundaries around me. When I went into the Old City, I didn’t cross into the Muslim Quarter. When I walked around Jerusalem’s City Center, I noticed that taxi drivers advertised they were Jewish by flying the Israeli flag atop their cabs. The other day a Palestinian boy and his blind grandfather begged me for money. “Mrs., Mrs.,” the boy said in Hebrew. “Kessef, money.” I quickened my steps. “No money,” I said in my fractured Hebrew. “Please, Mrs.,” he said in his equally fractured English. He followed me all the way to the café where I was meeting friends. There he conducted a long, convoluted negotiation with my friend, which yielded him 20 shekels or about $5. “I’m sorry he frightened you,” said my friend. I felt a mixture of shame and relief. This is the week of the anniversary of Yitzhak Rabin’s assassination by a Israeli right-wing, extremist Jew. This is also the week that Richard Lakin, an Israeli-American who was originally from Newton, Massachusetts, died of wounds he sustained when a Palestinian stabbed and shot him on a bus in Jerusalem. Lakin immigrated to this country decades ago with hope and optimism and advocated for co-existence and peace in this country. I have promised my husband that I will not take public transportation on this trip. It’s a promise I easily keep because fear keeps me from boarding the Number 18 bus on Emek Refaim, a busy thoroughfare. During the second intifada in 2003, a suicide bomber blew up a Number 18 leaving ten people dead and over a hundred hurt. I’ve taken to meeting colleagues and doing work in the Grand Café on Beit Lechem Road. Beit Lechem is Hebrew for Bethlehem. It means house of bread, and I have spent my mornings in a house redolent with the smell of bread and coffee and pastries. Every once in a while it occurs to me that it could also be a house of tragedy or even carnage. I tell myself that a stabbing or a suicide bombing is highly unlikely here. Things have been relatively quiet except for the occasional siren piercing the calm. That’s when my mind blows up my fear into the size of a balloon floating in the Macy’s Thanksgiving Day parade. 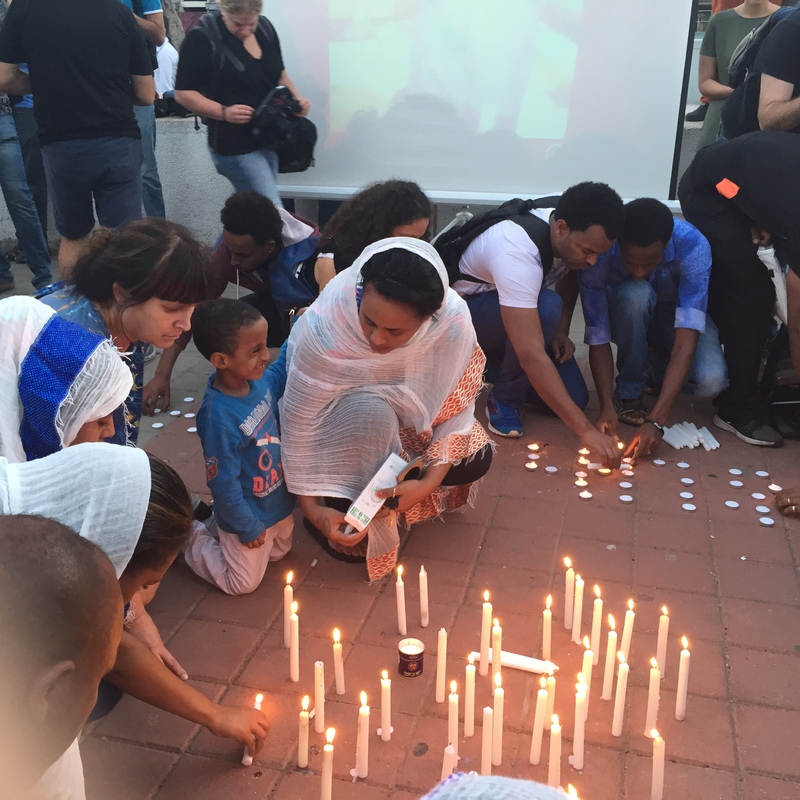 “Blood is flowing in the streets of Israel,” a well-meaning friend said to me just before I left. Her comment felt like a throwback to the first and second intifadas. But my Israeli friends are adamant that this is not an intifada. That would imply there is some organization behind this latest spasm of violence. But rather these scattered, random acts of violence are borne of pent up rage. A thirteen-year old Palestinian boy stabs an Israeli Jewish boy. A Jewish settler attempts to stab a peace activist, a rabbi who has accompanied a group of Palestinians harvesting olives on the West Bank. A journalist friend says that this country runs on magical thinking. During the second intifada, her children were small and every morning she made sure to know what clothes they were wearing as a protection, a charm against getting a call to identify their bodies. In that same conversation she casually mentioned that Palestinians are throwing Molotov cocktails a few streets over from her house. She shrugged her shoulders and told me this is how it is these days. Ireland had “The Troubles” and Israel has “The Matsav” — the situation. There is an Israeli saying that, “If you were once burned by hot water, you will be afraid of cold water, too.” There is so much cold water rushing around me—Palestinian construction workers, women in hijabs, little Arab boys looking for a handout. My fear is valid. My fear is exaggerated. I indulge in magical thinking to keep me safe. Maybe tomorrow I will not be afraid. Jerusalem is a city with three Sabbaths—holy days that make for a long weekend often rife with prayers and recriminations. This is a beautiful, tense, chaotic, sometimes violent city that comes to a short peaceful halt during the call of the muezzin, the songs of a Shabbat evening, or the tactile recitation on the rosary. Prayer is a serious, pervasive business in Jerusalem. 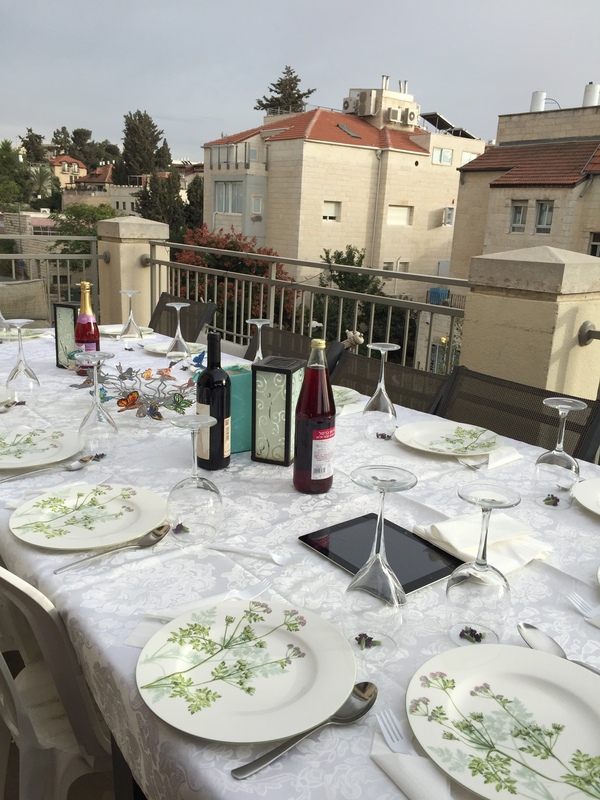 On a Friday night I sit alone on the terrace of a friend’s apartment in Jerusalem’s Baka neighborhood. The rush to finish all the preparations before the Shabbat siren goes off have left me exhausted and I’ve decided not to go to Kabbalat Shabbat services with my hosts. But Kabbalat Shabbat—the receiving of the Sabbath—comes to me anyway. I hear the traditional songs of the service saturating the night sky from a not too distant synagogue. In the lull, there is the Muslim call to worship, its minor key making the imperative to pray sound doleful. Prayer is a sad, provocative, life and death affair in this country. Despair is not what I feel and yet I’m not hopeful either. At Friday night dinner my friends have a lovely tradition of passing around “angel cards.” Printed on each card are words, in Hebrew with English translation, like friendship, nourishment, synthesis, finding one’s way, truth. The words are a catalyst for conversation. But they are also resonant in the way they are both consoling and provocative. My angel card bears the word refuah or healing. Refuah shelama—a complete healing—is the Hebrew phrase for wishing someone a full recovery. The most immediate explanation would be to state the obvious: Israel is ailing, hemorrhaging literally and figuratively. Only a refuah shelma can save her. But like the knifings that have been daily occurrences in this country for the past month, the wounds—physical and emotional—are deeper than ever. Later in the night, helicopters hover and sirens wail. Jerusalem is under attack again, from within.